The suns sets into a mist and casts its warm light over McWay Cove, Julia Pfeiffer Burns State Park, Big Sur, California, USA. McWay waterfall is an 80-foot fresh water fall fed by McWay Creek. 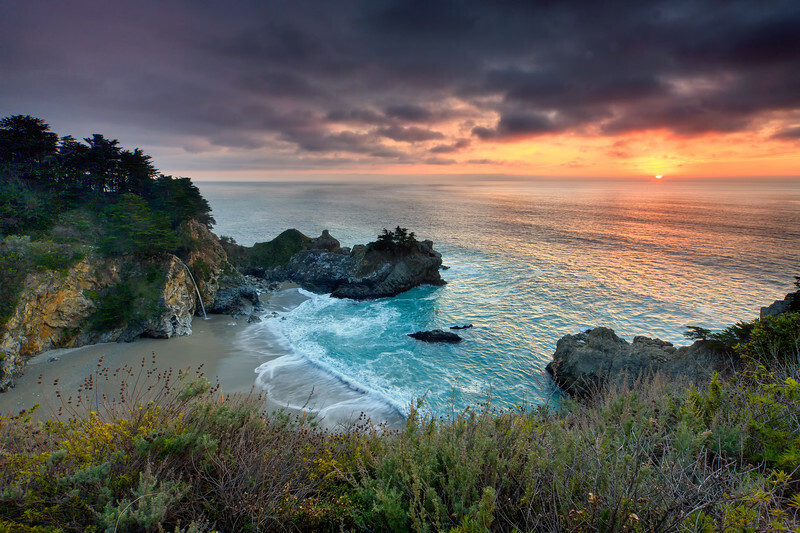 Fall in Big Sur means magical sunrises and sunsets. Because of the colder temperatures, the summertime marine layer disappears allowing for vibrant sunsets that can last for up to an hour! It also means that the sun has journeyed far enough south to allow for its low rays to provide the magical shaft of light through the famed Keyhole Arch at Pfeiffer Beach! Photographers from around the world journey to Pfeiffer Beach in hopes of seeing this special light. We will have four attempts at capturing it during this workshop! Though the light is present from late-November until early-February, I have seen it at its most intense during this time period (due to the nature of the tides which factor into diffraction of the sun's rays). Each year my students have been treated to some of the most intense light I've ever witnessed pouring through the arch. This year I have positioned the workshop to take advantage of a full moonset from various locations. We will have two mornings to photograph locations that include the setting moon at varying heights in the sky over the ocean! These dates will also allow us to experience this area without the usual crunch of tourists as many of the other locations we will be visiting are also popular tourist destinations. Early November swells oftentimes produce large pounding waves. If we have any small storms on the horizon, we will have even larger swells! Typically, January and February are the wettest month on the Peninsula, averaging just over 4 inches of rain. This is why I have decided to place this popular workshop in early November. We will get some tremendous light on either side of the storms if they do arrive. Early-season storms also serve to increase swell activity making wave images more dramatic. When the storms pass (and that is generally rapid), I have seen some incredible skies with cloud formations that catch the color of the rising and setting sun. My motto has always been, "When the tourists are heading in, a nature photographer should be heading out. Wild weather makes for dramatic images!" We will also be able to take advantage of the beautiful fall color with the Sycamore and Oaks that are found in abundance in Andrew Molera State Park at this time of year. This workshop will have an emphasis on field location shooting. It will also include two sessions of Photoshop /Lightroom training and a minimum of two image review sessions. Workflow training will include: RAW processing in using the latest version of Lightroom and complete workflow training in the latest version of Photoshop. Workflow topics will include: preparing an image for both print and web presentation, proper methods of setting white and black points, how to "properly massaging the middle tones," color balance, localized tonal and color adjustments via luminosity masking, 32-bit blending techniques, blending multiple exposures via layers and masks, freehand masking techniques, section of masks based on both tones and colors, proper sharpening and noise reduction techniques, etc. We will also demonstrate On1, Luminar and other third-party plugins. Also planned is a night of star photography (weather permitting). I will be assisted in this workshop by another qualified instructor. Deadline: When workshop fills (limited to 12 students). Lodging: The workshop will be held at the Carmel Mission Inn next to the Crossroads and Barnyard Shopping Centers. Lodging is included in price of workshop. Each participant gets their own room - no sharing required, plus a full breakfast each morning of the workshop. Meals: Breakfast is included in the price of the workshop. Transportation: We will carpool to shooting locations. Participants are required to provide transportation to and from the workshop and from the airport. The Monterey Airport is only 15 minutes form the Carmel Mission Inn. Travel and other expenses: Under no circumstances will I refund any charge not paid to me, such as (but not limited to) airfare, lodging, car rental, or meals. Though I’ve never had to cancel a workshop, and consider the possibility extremely remote, for your peace of mind I strongly encourage you to purchase travel insurance to cover any losses resulting from a cancelled workshop. Permits and Insurances: Don Smith Photography LLC is fully permitted for all location shoots and carries full-coverage insurance for all workshops. Our instructors are certified with advance First Aid Training. Spousal, Relative and Friend Policy: Please Click Here. Cancellation Policy: Please click on link to read my Cancellation Policy. My Qualifications: If you like my style of photography, that would be one reason to take a workshop with me. If you want to take your photography to the next level, that would be another reason. I run my workshops in a positive environment and give you ideas and techniques to move you forward. To learn more about me, please click here.